I'm Not a Regular Mom, I'm Chic and Street Style Mom! I'm not a regular Mom, I am a chic and street style mom! What does this mean, you ask? Well, it just means that I love dressing up even when I am feeling down, at my worst, or not in the mood! And you all know that my style consist of chic and street style looks, and affordable ones too! 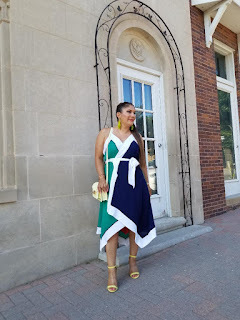 Today's blog post includes two pieces I absolutely fell in love with from the Gabrielle Union Collection for New York and Company! I love that New York and Company makes it affordable for us by having major sale coupons like $100 off $200 and so forth! This allows me to buy more than one piece at a time! Several at that! As you all know, I am the biggest Jennifer Lopez fan there is! Yes, and I love when I can get her look for less and style it my way but also showcasing similarities from hers! I like styling her looks no matter how old or how recent. She is a woman who can rock anything! I love that we have so much in common when it comes to fashion, even though I have never met her (still hopeful), and I like that anything she wears, she looks amazing in! The first look below I absolutely love because it's classic, simple, and fun! I love wearing bodysuits and jeans, and who does not love a good pair of over sized hoops?! Jennifer wore this look back in August 2017 and I am still loving it! 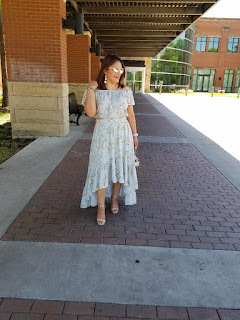 Serving Spring Looks with the Eva Mendes Collection! When five women get together over social media and become not just fashion sisters' but great friends, good things happen! And, we are once again sharing our favorite collection from our favorite store! If there is one thing in common for us all, it is the ultimate love we have for Eva Mendes and her collection at New York and Company! Two of the beautiful blogger's and girlfriend's of mine have had the honor of meeting the beautiful Eva Mendes in person (three of us to go)! And they both have wonderful things to say and great memories of their wish come true to always talk about! Chic Spring to Summer Shorts! Hey Fashionista Babes! This blog post, we chat about shorts for late Spring into Summer! I know you all know, that I love wearing shorts, even today, in my late 30's! No, no shame in my game, honey! I will wear shorts for as long as gravity allows me to! Those of you who follow me on social media and read my blog posts already know this! 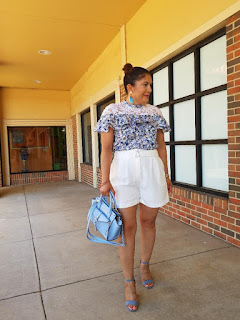 I'm all about making shorts chic and street style and I love a good sale on pretty shorts even better! From a Two-Piece Look to a One-Piece Look! Tis' the Season for crop tops and maxi skirts, short-long hem skirts, and maxi dresses! I am in my late 30's and I still buy short shorts, crop tops, and even rompers! I have always said, If I feel great in it, I am wearing it! No shame in my game! Today's look is special because I bought it to match my daughter's floral dress for my 9 year old's First Communion! But, I didn't want to wear a crop top to church, so, I decided to put a wide belt on it and it went from a two piece to a one piece, a dress! The crop top and skirt are Xhiliration from Target and these two pieces I did pay regular price! Only for the occasion! Both were under $45.00, which is still not bad! The belt Ive had a few months and the ankle strap block heels as well (Payless). The ring handle bag is from Forever21! The sunnies were a clearance find from Payless a few months ago under $5.00! This look gives me all the Spring feels!